Hello There Professional Quote Enthusiasts! The time has come to stack up our files, briefly defragment our hard drives and listen to the pearls of professional wisdom only Professional Eric could share. Today at work there was a discussion about our company and it’s professional standing. Which by the way, our company is practically an architectural Yeti… no one know about us, and we have fabulous hair. 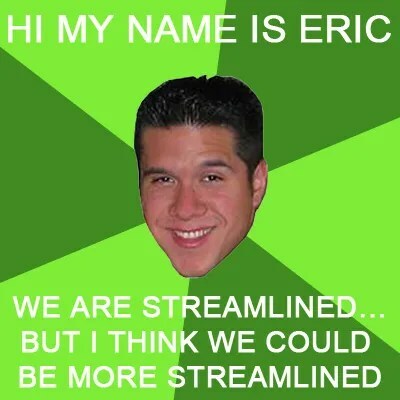 As anyone could imagine, Eric was all over this conversation… because he likes to get down with verbal professionalism. He informed our boss man that has an office revitalization plan under glass at his desk… So, basically he’s going to change our little office into the 6 million dollar man, or into a car microwave… Either would be good. We have the technology! We can make it better than it was before! Better, stronger, faster. Oh Jen, I cannot wait to tell him about this comment. I’m sure it will give him the professional giggles! I wish we did! How much fun would that be… Quotes and Photoshop everywhere! The printers would be alive with the sound of professionalism! I actually have a word file with hilarious things that he says out of context that I save for the PQOTD. And for some reason when paired with that photo… it’s the best thing ever! You NEVER disappoint, young lady!